Vienna to Salzburg still within Austria took us about 3 hours drive. 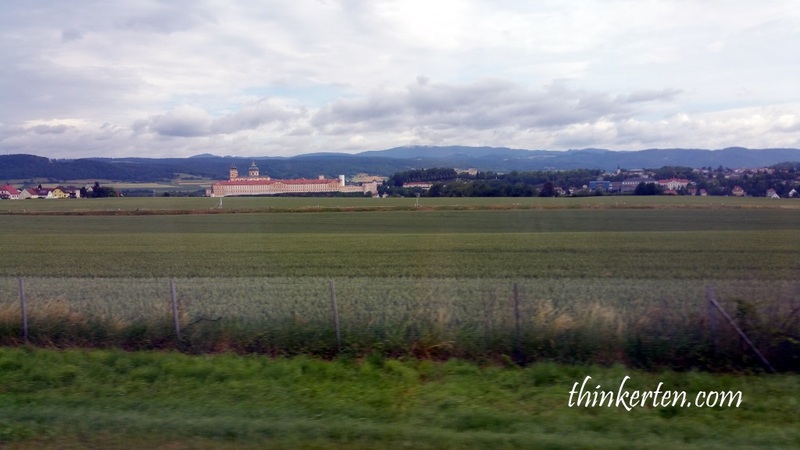 When we were in the Vienna freeway to Salzburg, we could still see the Summer Palace -Schonbrunn from afar. Goodbye Schonbrunn Palace! 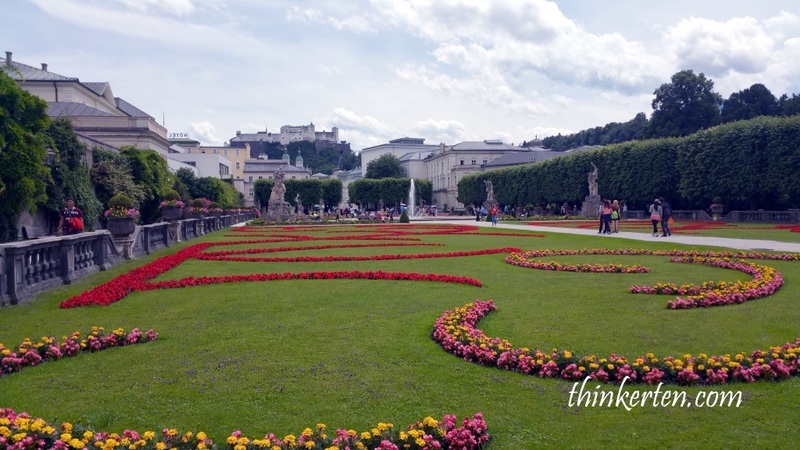 Salzburg is renowned for its scenic Alpine surroundings. 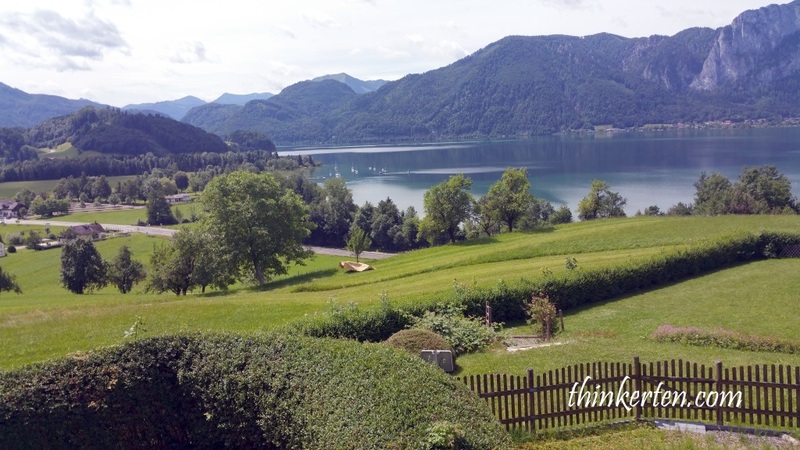 We stopped for lunch at a scenic restaurant one hour before Salzburg. 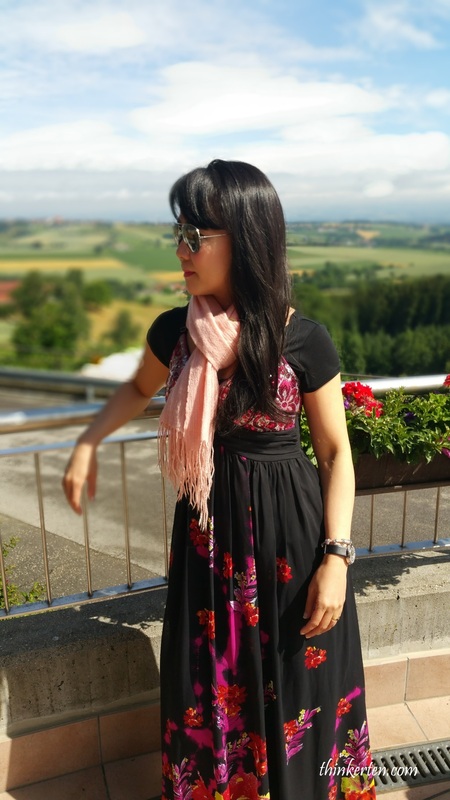 The weather was super good that day, sunny and warm and it was just perfect to have lunch in such a nice surrounding. Look at the mountain and the lake, I was speechless! One funny thing I observed were all the Asian stayed inside the restaurant and all the Caucasian stayed outdoor to enjoy their lunch with plenty of sunshine. Mirabell is a female name form Italy, a compound of the words mirabile -‘admirable‘ and bella – ‘beautiful‘. The classic movie, the “Sound of Music” was shoot here. 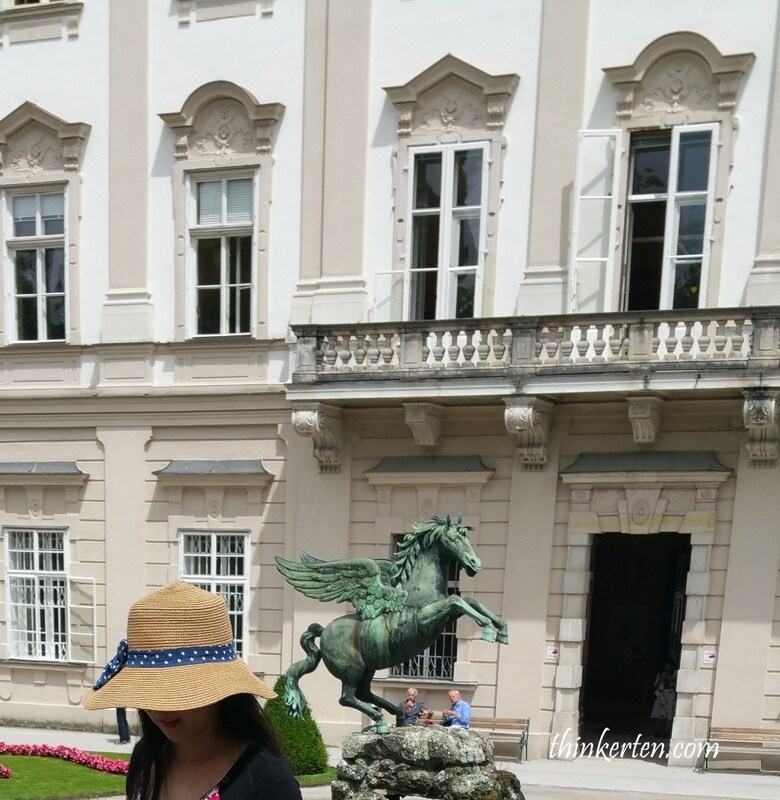 The Pegasus Fountain – a sculpture of horse, Pegasus. The Grand Fountain pool – four groups of figures by 17-18 century famous Barogue Italian sculptor, Ottavia Mosto, representing 4 elements: Fire, Air,Earth and Water. The Hedge Theater – oldest theaters north of the Alps. The Dwarf Garden – 28 dwarves made from white Untersberger marble and is the oldest of its kind in Europe. The Orangery – a palm house. My mood was lifted up by the bright and colorful flowers. Mirabell Garden is a popular place for wedding ceremonies and the garden is a wonderful location for photographs. Today Mirabell Palace is used for political business. It houses the offices of Salzburg’s mayor and the municipal council. The white building in the below picture is the part of the palace. The Makartsteg is a bridge over the Salzach River in Salzburg′s city centre. 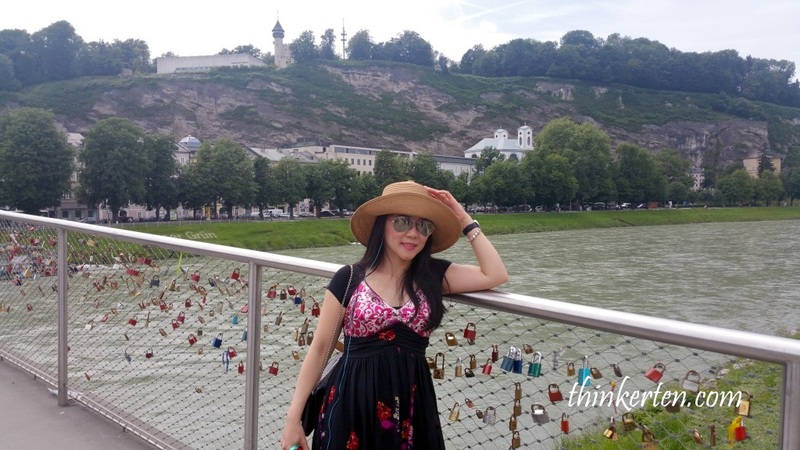 This is Salzburg modern pedestrian bridge, where you can see lovers locked their padlocks and attached to the fence. There is a castle at the background which make this bridge even more romantic! Makartsteg is open for pedestrians and cyclists only. The other side of the view has less building. 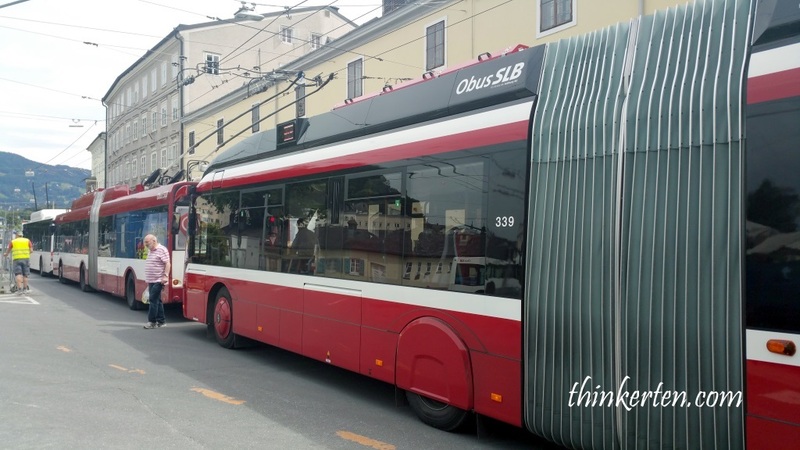 I spotted this tram services in the historical town in Salzburg, they also called as trolleybuses (Obus). The Obus system started since 1940, that was almost 70 years ago. Just hopped on the trolleybuses and it’s a great way to see the city of Salzburg. 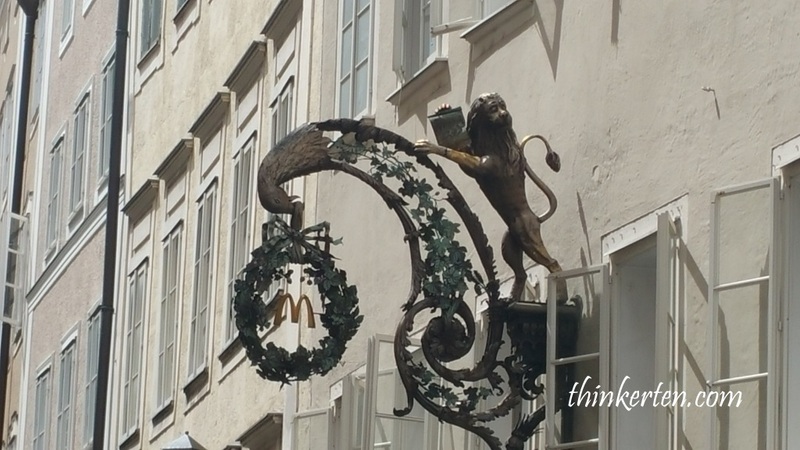 Had a tea break at the McDonald in Salzburg. 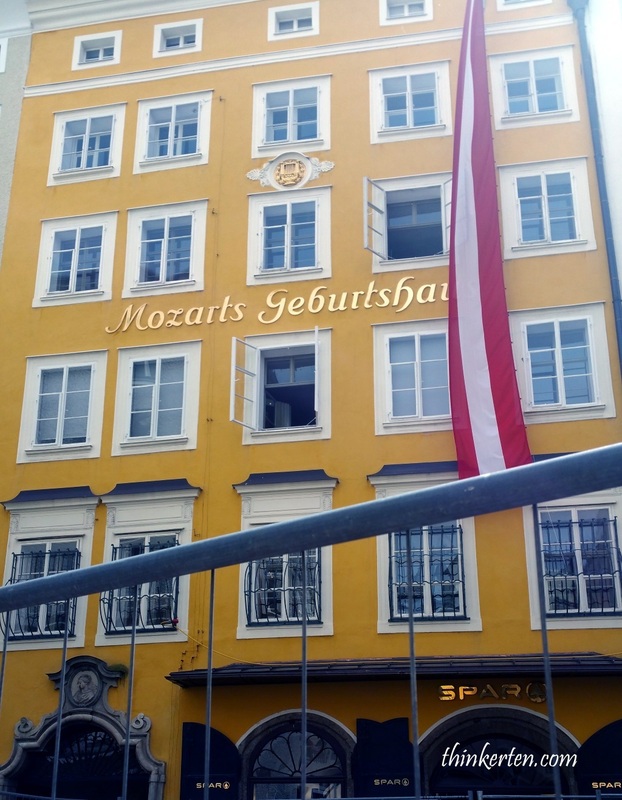 The below yellow building was the birthplace of the greatest composer, Mozart. It is now a museum and opened for the public to see the early life of Mozart. Altogether there are three floors but Mozart family was lived in the third floor of the building and there is an actual room where you can see where Mozart was born. Mozart’s entirely family was moved here as the old place was too small for the big family, The new, more spacious home provided enough rooms to entertain friends and musicians. Today, it is also a museum open for public. If you have been to the birthplace at 9 Getreidegasse then you can skip this one. Give him 1 Euro and you can have a picture with him. Solute his guy standing for hours in the square under the hot sun. Many horse carriages were waiting to pick up tourists in the Residence Square. 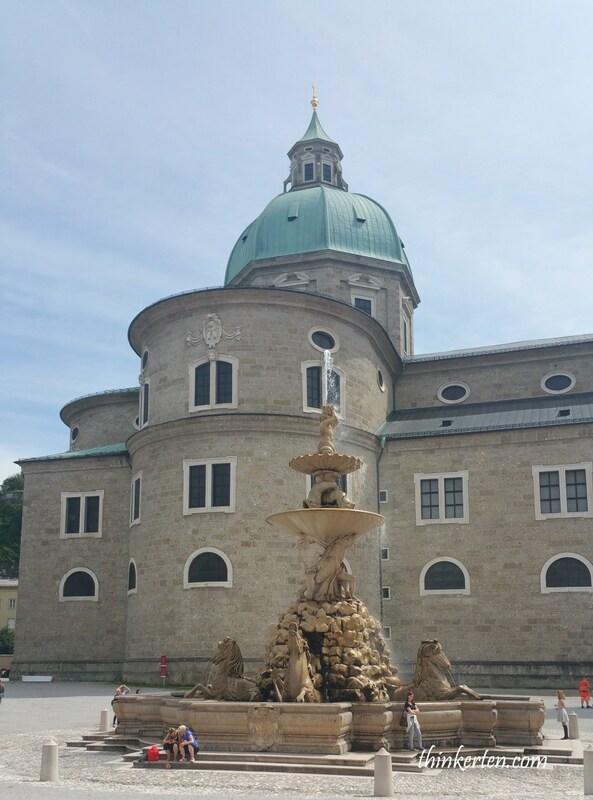 This is a striking central square of Salzburg, also known as Residenzplatz. 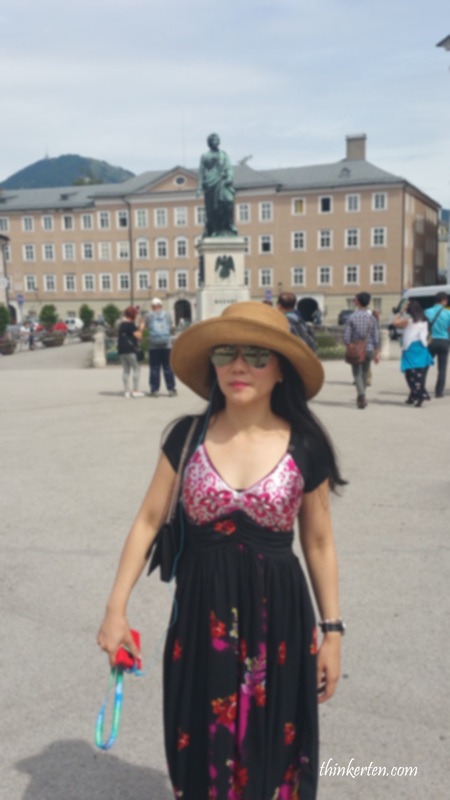 Thousand years ago, this is the place where the Prince Archbishops of Salzburg entertained his guests, the big Resident Square was acting like their front garden. The wide courtyard was definitely a good space to hold the Royal Guests! Nowadays, all kinds of events take place in Residenzplatz Square, from rock and pop concerts and festivals. The Fountain is considered one of the important and the largest baroque fountain of Middle Europe! 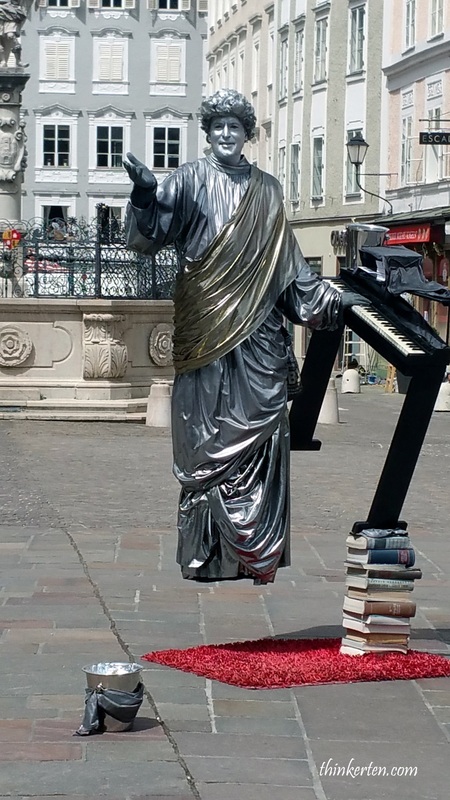 This is just a square with a prominent Mozart statue standing in the middle. Tourists rushed here to take pictures with the statue and move on. 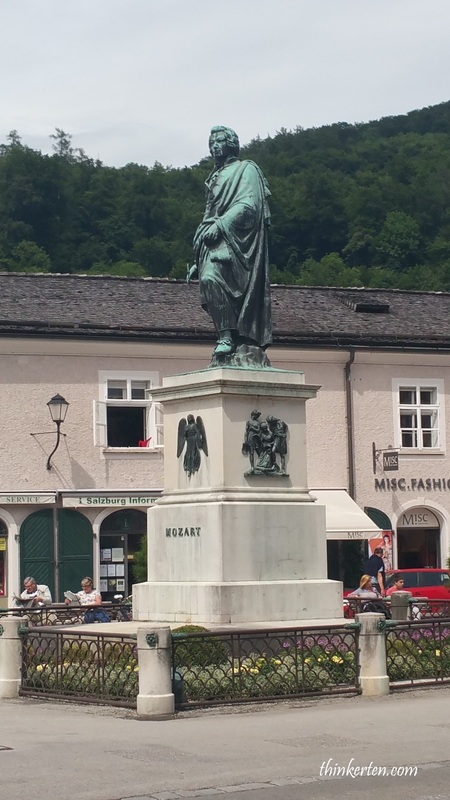 When you talked about Salzburg, you have to visit Mozart Statue, birth place and his residence. Our day end with shopping, it was just a window shopping for me. Everything was quite expensive compared to Prague, Krakow and Budapest. A cap cost 10-15 Euro in Salzburg whereas I can just get it with 4-6 Euro in Prague or Budapest. Souvenirs cost double. Many souvenirs shops are opened by Chinese. Salzburg has many overseas students living here. 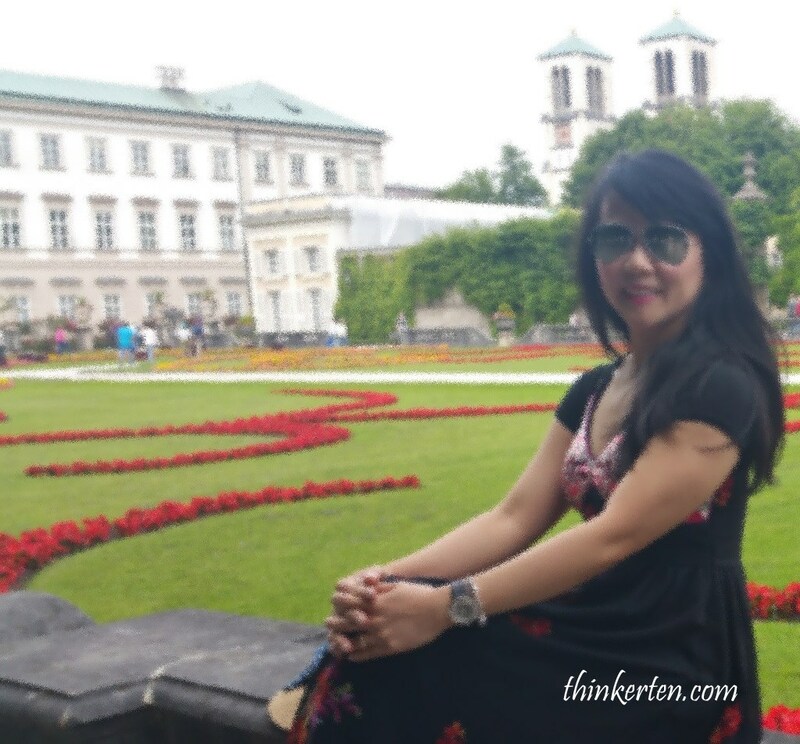 My advise is to do more shopping in Prague, Krakow and Budapest if you are in Eastern Europe. I love this place very much, will go back again. Yes, me too. I am glad you like it, Judy.